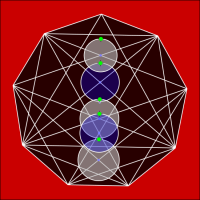 Every diagonal within a regular nonagon is drawn. Circles are centered at each intersection of diagonals along a vertical axis (these same constructions can be made nine times around the nonagon). Each circle can be tangent to at least 4 diagonals when the circle is at least 2 different sizes. Unnecessary diagonals have been hidden. Drag the green points to resize the circles. Can you find all 13 positions where a circle is tangent to at least 4 diagonals? Hint: sometimes the circle is not entirely contained within the nonagon. Ready for more? Check out the hendecagon version!